With almost 60 percent market share, Chrome is the biggest browser out there. Trusted by millions, if not billions, it is fast and reliable. But did you know there are many chrome extensions available to personalize your surfing? You can find them all in the Chrome web store. As we are a big fan of personalization, (that’s why we’ve developed our own extension, by the way) we love to present five of our favorites. Use OneTab to transform a list of open tabs into a single, fast loading list. One of the major problems with the Internet is the sheer quantity of information available. There’s so little time and so much to do! Anything that can help you organize things with the single click of a button is genius. Just remember that OneTab doesn’t only clean up memory space, it also makes you reload the tab if you want to return to it. This could take some time, especially if you restore them all at once. 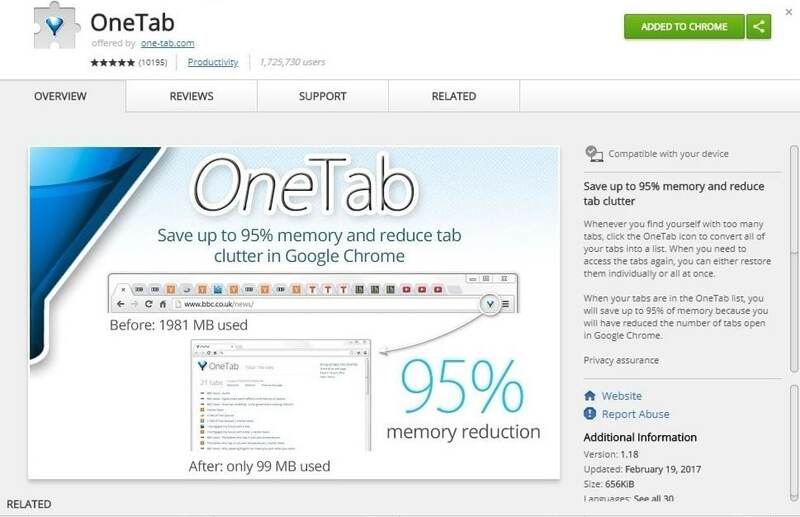 Still, we love the way OneTab helps us manage the regular avalanche of tabs we face every day! 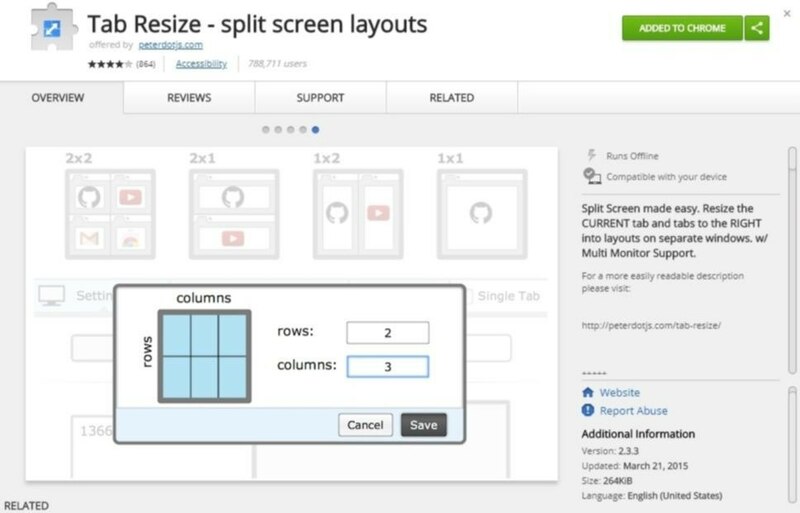 Chrome extension Tab Resize give you another chance to bring order to chaos. Of all Chrome extensions, Tab Resize might just change your workflow. Especially useful on larger screens, you can use it to multitask just the way you want to. You could take notes while watching an online course or a Ted presentation. You could use it to translate a text, keeping your own version right next to the original. And also: there’s no easier way to use multiple monitors. One click really does the trick. 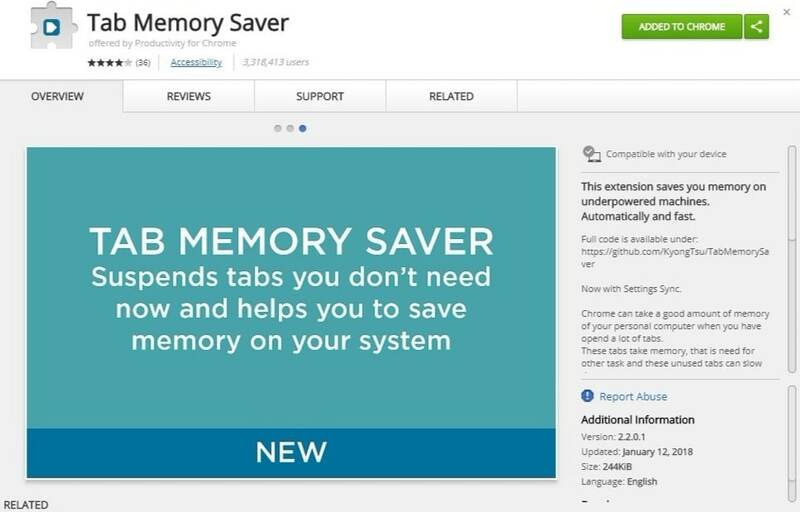 Tab Memory Saver suspends tabs you don’t need. Back in the day when Chrome first appeared, one of its biggest technical advances was the way they made tabs function. Unlike other browsers at the time (do you remember Internet Explorer?) they decided to make every tab control its own processes. That’s why you can still easily separate tabs from each other: they are essentially just ever so many different programs running simultaneously. There’s no problem when one tab fails or stalls. The other tabs won’t crash. But what happens when you run ten such tabs at the same time? Or even twenty? Your computer might just get overloaded. You could try OneTab to clear some memory, but if you don’t want to switch to a list, you could install Tab Memory Saver. Over 3 million users depend on it to keep their limited computer resources as functional as possible. It simply suspends the tabs you’re not using. Talk about smart! If you want to surf the web, you don’t just need to toggle your tabs and keep them organized. You also need safe access to all the sites you’re interested in. LastPass gives you a secure vault you can use on any device and that will keep your passwords complex and impossible to guess. You just need to remember one single password, that’s it. For this service, you will pay a small price, but it will keep your mind at ease. Even when your computer crashes or you decide to clean up Chrome, LastPass makes sure your most sensitive data is stored safely and securely. 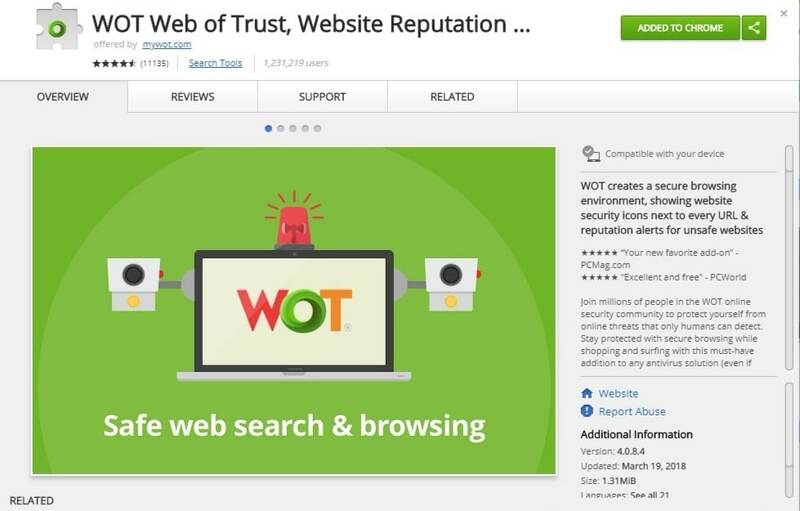 Web of Trust is all about reputation and the wisdom of the crowd. 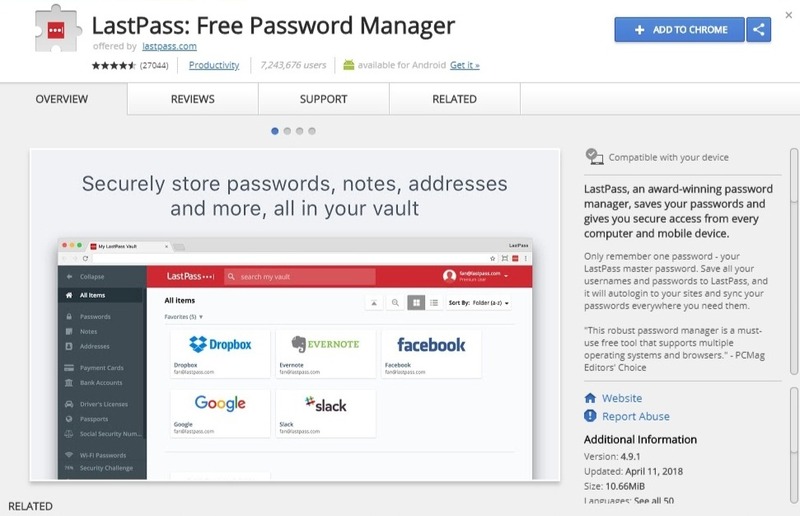 If you are concerned about safety online, you make a great step forward by using a professional password manager like LastPass. Another step might just be this small but informative extension: Web Of Trust. It’s all built on the basic assumption that there’s wisdom in the crowd. At a glance, you can see the perceived quality of the site you’re visiting. From green to red, it clearly shows you if you’re in dangerous waters or not. You can even join the crowd in rating the sites you visit yourself. Another application could be the Internet-eduction of your child or pupil. WOT makes it easier to interpret the information they encounter online. Fake news or not, WOT might just help them to understand the difference. At least it could get the conversation going. With these five extensions, we hope to make your surfin’ life just a little bit more fun and fast. And safe. At the same time, we realize we have only scratched the surface of the many possible extensions. And we haven’t even touched on Firefox or Safari, who offer much the same possibilities. We hardly know where to start, frankly. That’s why we’re curious: you, the reader of our blog, surely also use a fair selection of extensions. Which ones are your favorites? Which ones make your life easier? Please let us know in the comments below and share this with the community. We’d love to hear from you! Thank you and your crew for providing to me with what Microsoft took away. A convenient blocked list of things I am interested in without all the thumbnail photos which shorten the amount of info that can be displayed on one page. I want to work from lists not photos. Tried several different start pages and this one was the only one that worked for me. Thanks again, you truly are number ONE in my book. The largest personal startpage in the world!